I grew up in Mt. Vernon, Illinois. I have always been interested in science, and always been a big fan of space and NASA. My high school Chemistry teacher inspired me to go into Chemistry. During my senior year in high school I took independent study in both Chemistry and Physics. During that time, this same teacher told me about a class he had taken on Cosmochemistry. I didn’t know that you could combine Chemistry and Astronomy – I was so excited! 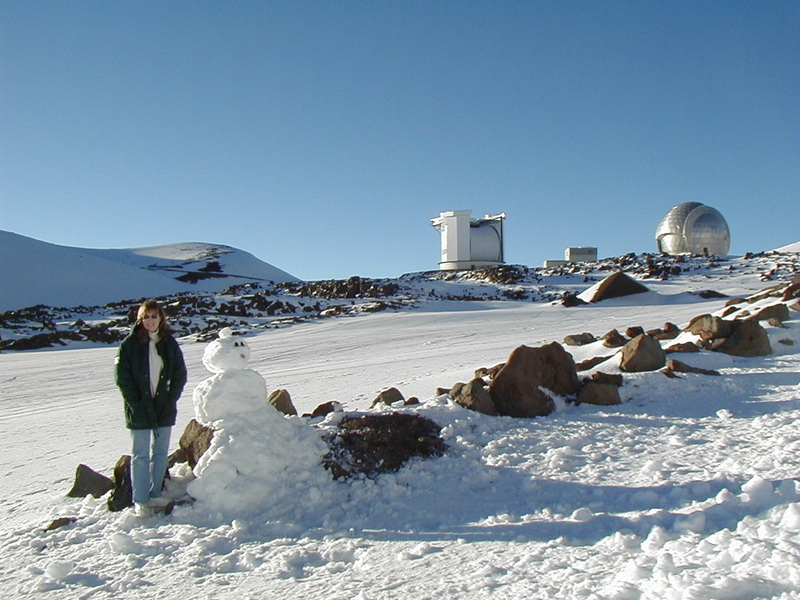 From that point on, this was my career goal – to find a job that allowed me to work in both Chemistry and Astronomy. As an undergrad, I did research in Chemistry with meteorites. In grad school, I learned observational astronomy while also doing laboratory chemistry. Now I’m a research professor at Emory University and my research program is in Astrochemistry. I am a research professor at Emory University. My job involves teaching, research, and service. In addition to teaching, I run a research group. Currently that group has 5 graduate students and 2 undergraduate students. We do a combination of laboratory spectroscopy, observational astronomy, and astrochemical modeling. I spend a lot of my time writing grant proposals so that I have the funding to pay my students and buy equipment and chemicals for the lab. We publish papers, go to conferences, and on occasion go to exotic places to use telescopes. I spend a lot of time discussing science with my students. In terms of service, I am on several department and university committees that deal with everything from curriculum reform, to faculty awards, to graduate school policies. I am also vice-chair elect for the American Chemical Society subdivision of Astrochemistry. I serve on the Editorial Board for the Journal of Molecular Spectroscopy. I am on the Executive Council for the Southeast Laboratory Astrophysics Consortium. And I am on the advisory committee for the International Symposium on Molecular Spectroscopy. I am a science professor -- everything I do is STEM related! Yes, I have had a few challenges. On occasion I get a particularly hard time from certain men in my research field who challenge my expertise when I give conference presentations or submit a paper. I also had trouble early in my time as a professor from students who challenged my authority in the classroom and doubted whether I actually knew the material. Both of these things are getting much better as I gain more experience. It also helps that word has gotten out that I actually do know what I am doing. My best advice is to keep going and persevere. The best thing you can do to change the state for women in STEM is work hard and prove the naysayers wrong! There are two things in my job that are particularly satisfying. First is my research. I absolutely LOVE my research. I wish I had more time to spend in the lab, working with my students. This time is the best part of my day. I also love that moment when I help a student in my class to understand material with which they had been struggling. It is so rewarding to see students succeed, and know that I played some part in that. The worst part of my job is meetings … there are so many meetings! Also, taking rejection is difficult. It is hard to receive negative feedback on grants and papers, even when it is constructive. But that is part of the job, and I learn from each of those rejections. This is challenging, but something that is particularly important to me. My husband is also a chemistry professor. We have an 8 month old baby. It is really a challenge for us to keep our schedules in sync and get time together as a family. But we make family a priority. We carve out time whenever we can to make sure that our personal life doesn’t get consumed by work. The best advice I have on this is to schedule personal time, and stick to your schedule. Turn off your phone, step away from your computer, and enjoy your time off. It will make you a better scientist if you give your mind time to rest. To me, success is achieving your personal goals. Doing the best job that you can do on the things to which you have committed. No one should ever ask more of you than you ask of yourself. As long as you live up to your own expectations, you have achieved success. Passion. If you don’t love what you do, then there is no point in doing it every day for the rest of your life. I have so many amazing mentors, it’s hard to pick even just a few. My aunt inspired me to be a scientist. My high school chemistry teacher inspired me to be a chemist. My undergraduate research advisor taught me how to actually be a scientist. My graduate advisor taught me how to be an excellent scientist while also keeping my life in balance. My research collaborator taught me how to be a careful scientist. And friend from my time as a postdoc taught me how to be a scientist who is also a good person. There are two pieces of advice that have helped me the most since I became a professor. The first was “Don’t become embroiled in a stupid argument with stupid, highly educated people.” The second was “Never hesitate to pay someone to help you do something that you don’t have time to do yourself.” Both of these things have saved me a ton of hassle and grief. I guess the moral of that life lesson is to not waste time on the things that don’t matter. The other piece of advice that I would give is to realize that you cannot possibly finish everything on your to-do list. That’s okay. Do what you can, and focus on the things that are most important.